Clobberella is a superhero, and one of the three members of The New Justice Team. 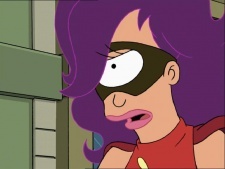 Her secret identity is Turanga Leela. Clobberella's superpowers include super strength, "lickity-speed", and invulnerability. She gained these superpowers from rubbing Dr. FlimFlam's miracle cream on herself. Clobberella wears a red jumpsuit with an image of a hand holding a rolling pin. The costume also includes a black mask, orange boots, and gloves. She wears her hair down. Clobberella is quick-tempered and has a very head-first approach to crime-fighting. She defeats many foes with a roundhouse kick to the head. Clobberella fought against The Zookeeper and The Son of the Sun. When fighting against The Zookeeper, she used her superpowers to keep him from stealing the Quantum Gemerald. She succeeded in protecting the Gemerald, despite the escape of The Zookeeper. Later, after Morris gave away her secret identity, The Zookeeper kidnapped her parents. Because of this, Clobberella was forced to steal the Quantum Gemerald and give it to The Zookeeper so he would let go of her parents. When she fought The Son of the Sun, Clobberella helped him get over his fear of the dark. Clobberella, along with the rest of the New Justice Team, retired mainly due to several factors. These factors include her secret identity being given away by her parents, The New Justice Team stealing the Quantum Gemerald and therefore being criminals, and the team running out of miracle cream. She has only occasionally appeared since her retirement. Cloberella's verse in the New Justice Team Theme Song is as follows. Who does she beat up? The name Clobberella is a spoof of the superhero Barbarella. The hairdo Leela wears as Clobberella is the same hairdo as the one she wears in "A Bicyclops Built for Two". This page was last edited on 1 September 2013, at 02:16.